Professional musicians are called Ustadan (plural for Ustad). In days past, the Mehtre (the king) used to have the best musicians for their own and had them play on leisure as well as on various occasions: when going to war, welcoming guests, playing polo etc. These musicians used to belong to a special caste called doms and were hereditary. Nowadays, anyone can become a musician, there are even training centers for the drums. 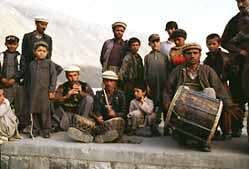 Also instead of belonging to the Mehtre, a band of professional musicians are included in the police and Chitral Scouts and perform on official occasions. The professional musicians play three kinds of instruments: two drums, dhol and damama, and a pipe, surnai. These three are always played together. 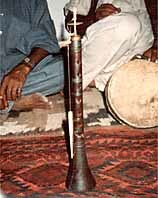 Sometimes, the surnai player will play an end blown pipe called belu. It is not a particular instrument of the doms but also used by general Chitralis. dhol--a cylindrical shaped two faced frame drum. It is played with bare hands or with a curved stick on right hand and left bare. diameter 38cm, length 36.
damama--an equal sized pair of hemispherical metal bowl drum. A small quantity of water is inserted inside the drum to adjust the pitch: one drum is tuned higher than the other. It is played by a pair of sticks. diameter 24cm, length 20cm. 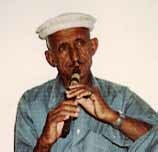 surnai--a double-reedpipe similar to an oboe. It has 7 finger holes and one at the back. length 46cm. belu--a small instrument, about 35cm long and have a recorder head, 7 finger holes and 1 at the back. Besides performing on official occasions, the professional musicians are invited on weddings or some private gatherings and play dance tunes. The melodies of the dance tunes which the surnai player plays are mostly popular folk songs favorite among the Chitralis.While, the rhythms of the can be distinguished into several types of pattern. Among them, rhythm of dani and sauz are popular . dani--This rhythm is used when the song is very slow. It is in a duple time and though starting in a simple rhythm, it changes as it goes along and becomes complex and entangling. The steps of the dance are also intricate. sauz--Sauz is in medium tempo. This is a hemiola rhythm: the dhol keeps a triple beat while the damama perform a duple beat. Precisely speaking, dani and sauz are not merely the rhythms of the drums but they stand for the tempo as well as the length of the original poem. Slow songs with long poems are called dani while fast songs with poems with short lines are called sauz. Aside from this two rhythms (style of music), there are various patterns. Famous old songs have their own rhythms. Hence without listening to the surnai, we can distinguish the song, only by listening to the drums. Nowadays a very fast rhythm called arghaniwar ( "Afghan tune" ) is becoming popular. arghaniwar--This is very fast rhythm in duple time that can be danced easily. The melodies of the songs are pashtu songs. 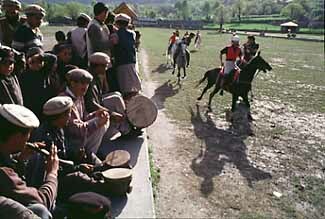 Besides dancing occasions, polo match is an important event for the professional musicians. Special tunes are played on the mornings whenever there is a match. When the game starts the musician will play accordingly: whenever points are taken, someone from the royal family makes a point, end of the game etc.